Eggplant cravings hit often for me. This dish started off as a eggplant parmigiana, but the end result is lighter and. brighter. 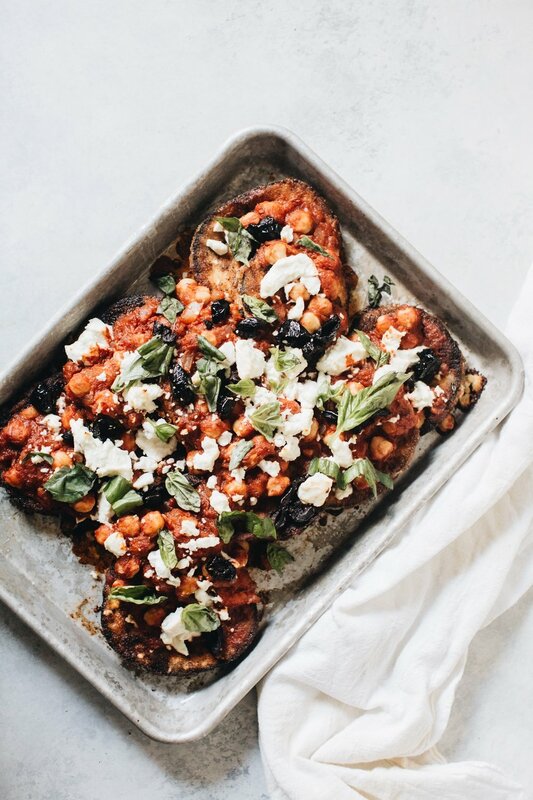 Eggplant, crusted in breadcrumbs, are lightly pan-fried and then stacked with a spicy tomato and chickpea sauce, adorned with a few olives and topped with zesty goats cheese. 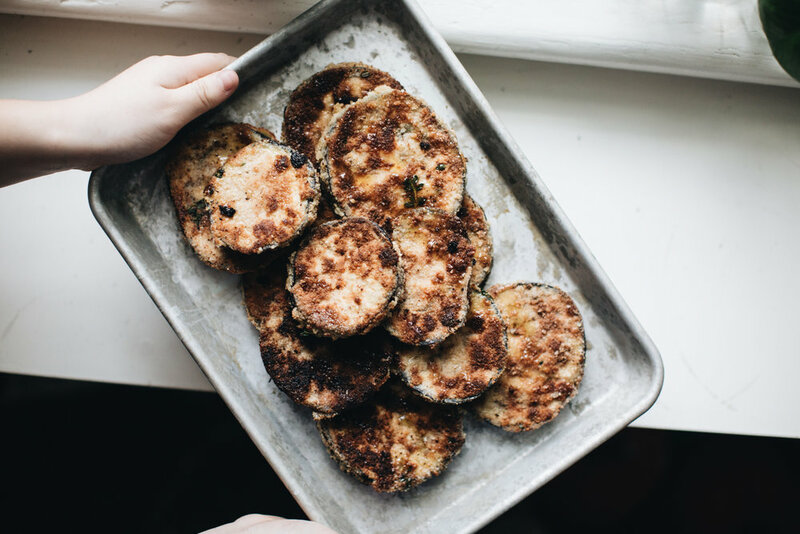 If you are short on time, or looking for a gluten free dish, you could easily chargrill or panfry the eggplant without the breadcrumb crust. This is a modern veggie stack, packed with flavour and comfort. To prepare the sauce, add a drizzle of oil to a medium saucepan and, once hot, add the onion, along with a pinch of sea salt. Cook for 2-3 minutes, stirring often, until the onion is soft, and then add the garlic. Cook for another 60 seconds, and then add the tomato, water, chickpeas, red pepper flakes, and sugar. Cook for 15-20 minutes, until the sauce is fragrant. (This sauce can be made ahead and stored in the fridge for 48 hours. It can also be frozen). To prepare the eggplant, combine the parmesan, breadcrumbs and thyme leave in a shallow bowl. Season with a pinch of salt and black pepper. Dip each eggplant round into the egg, and then into the breadcrumb mixture. Coat completely and then set aside onto a large plate or tray. Repeat until all the eggplant has been crusted. Heat a thin layer of olive or sunflower oil in large frying pan. When the oil is hot, add the eggplant slices and cook, in batches, about 1-2 minutes on both sides, until golden. Set aside. Place a few slices of eggplant, overlapping slightly, on a plate. 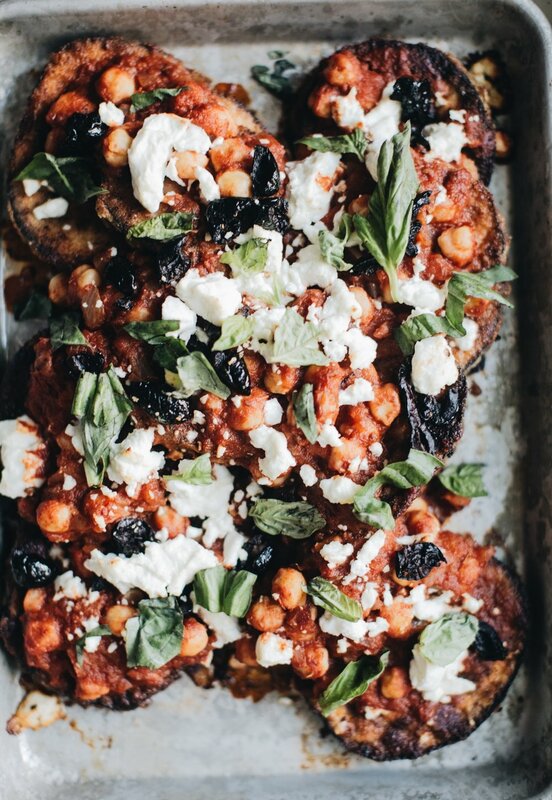 Top with the spicy tomato and chickpea sauce, and scatter with olives, basil leaves and goats cheese. To serve, season with pinch of sea salt and black pepper, and a drizzle of olive oil. Serve immediately.